Empedocles, born c. 490 BCE in Akragas, Sicily, is perhaps one of the more eccentric pre-Socratic philosophers. He himself claimed other-worldly powers, is credited by Aristotle as the inventor of rhetoric, and is thought to have originated the cosmogonic theory of the four elements: fire, air, water, and earth. 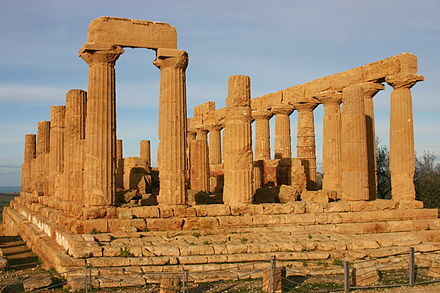 The temple of Hera at Akragas, built when Empedocles was a young man, c. 470 BC. While relatively little is known about Empedocles’ personal life, we do know he was born to a wealthy family who was involved in the overthrow of the Akragas tyrant in 470 BC. Diogenes relates the ambiguity regarding exactly of whom Empedocles was a student. 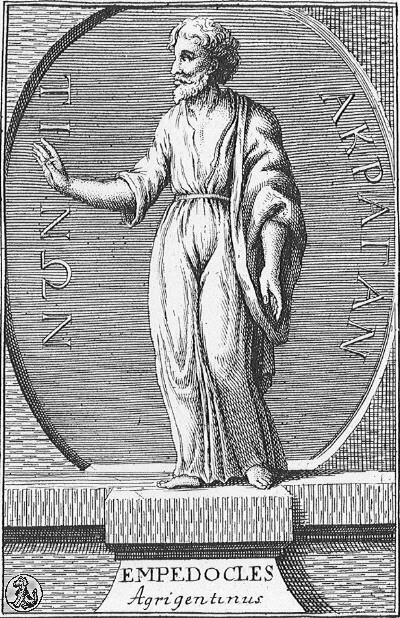 He offered the following options: that he was a student of Pythagoras himself, that he was a student of the Pythagorean school under the instruction of Huppasus and Brontinus, or that he could have originally been under the influence of Xenophanes and later “fell in with the Pythagoreans.” All of this confusion is due to the fact that Empedocles promoted his poetry at the start and the Pythagorean school had a law to admit no Epic poet. Indeed, he is generally considered the last Greek philosopher to have recorded his ideas in verse. Empedocles himself had one pupil mentioned, Gorgias, and his travels to the Peloponnese, Attica, and Thurii were mentioned by authors such as Timaeus and Dicaearchus. 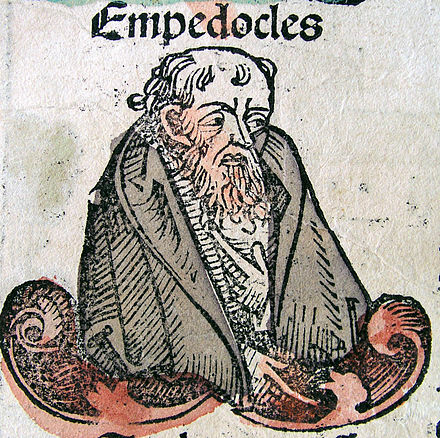 Empedocles’ philosophy and teachings are taken from the remaining fragments of his epics ‘On Nature’ and ‘Purifications.’ The core of Empedocles’ philosophy relied on the notion that all things are transformed and manipulated between the four worldly elements of fire, air, water, and earth, and that nothing is destroyed and nothing is created new. He believed that everything in the universe was made of these four root elements and was conscious. Combined with this attempt to simplify and organize the world, Empedocles’ doctrine promoted the idea that love was the unseen force holding things together, while strife was the force by which things were pulled apart. Love and Strife, then, were the ways in which the four elements were able to interact and mix together. 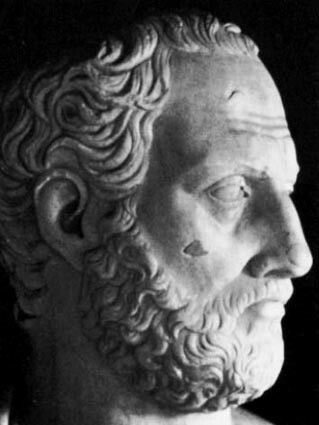 Empedocles’ philosophy about the universe was in response to the contemporary Eleatic School which was founded by Parmenides in southern Italy. The Eleatic School promoted the idea that “all is one” in the universe and everything existed in a single entity. 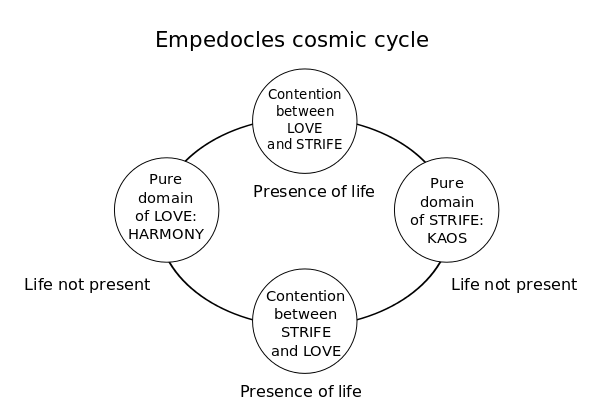 Empedocles pushed back a little by saying all is composed of the same four elements. While this concept is similar at the root of the argument, it did differ enough to constitute a separate philosophical school. Empedocles was (unsurprisingly) not very thorough. 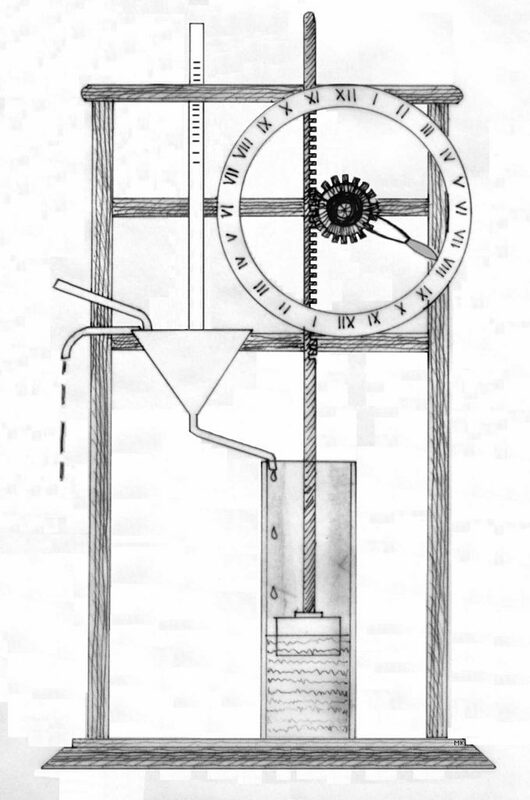 He did, though, prove that air was not empty space by using a clepsydra, which is a water clock or any timepiece by which time is measured by the regulated flow of liquid into or out from a vessel, and where the amount is then measured. 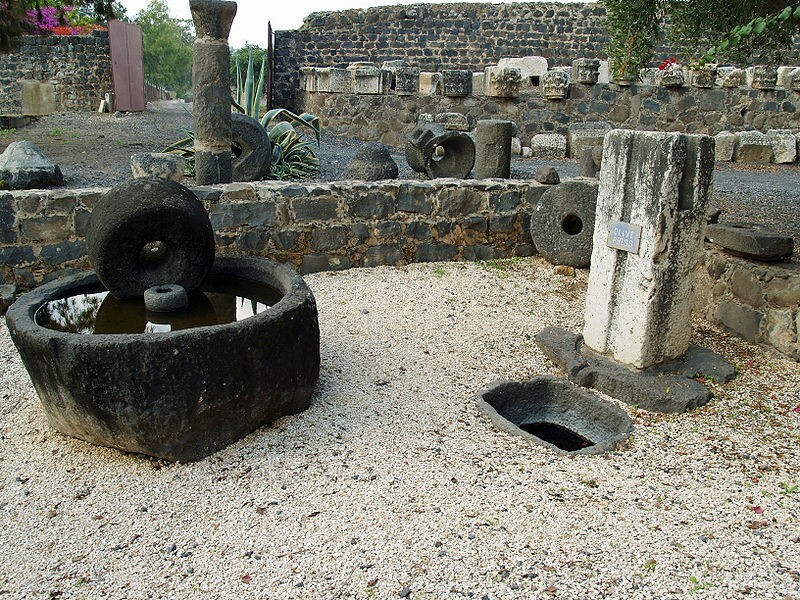 He did this by filling the clepsydra with water while covering the hole at the top. This allowed for his element of air to be an active ‘ingredient’ in comparison with earth, water, and fire – all tangible and manipulative elements. Another theory of Empedocles comes down to us through Aristotle in De Sensu. 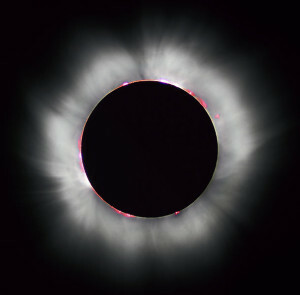 Empedocles thought that the light from the sun passed through intermediary space before being processed by our eyes, moving through space by whatever force. Indeed, Empedocles is credited with the first comprehensive theory of light and vision. But perhaps one of the more advanced undertakings of Empedocles gives us what is thought to be the earliest extant attempt to discern the origin of species. He introduces zoogony, or generations of animals, in his attempts to explain the origin and development of biological life as a coming together and unfolding of birth. He uses examples of wild animals, humans, and plants as his proofs. This theory is strongly in line with his overarching philosophy of things in strife and things in love. Indeed, we see what Empedocles thought was the practical application of such rules. Empedocles’ death is the stuff of legends, as he was mythologized by ancient writers. One story of which is where he died by throwing himself into Mount Etna, allowing him to turn into an immortal god. Another includes Empedocles being removed from the earth and his exact age at death is disputed anywhere between age 60 and age 109. Further descriptions of Empedocles and his ideas are recorded by Aristotle, Diogenes, Pliny, and Horace’s Ars Poetica. Aristotle called him the father of rhetoric and Lucretius speaks of him with enthusiasm, and evidently viewed him as his model. Much later his death is at the center of a 1826 play by Friedrich Holderlin, ‘Tod des Empedokles,’ and Matthew Arnold’s 1852 poem titled ‘Empedocles on Etna.’ While this eccentric philosopher may not be a household name today, he was clearly very influential in the ancient world and thus deserves our attention. There is probably no other ancient Greek philosopher who has been so misunderstood in our modern era. Nowadays his philosophy is associated with excess and drinking and food apps… but the reality is, he preached the exact opposite. Indeed, his name should connote moderation, science, atheism, death…and happiness? Who are we talking about? None other than Epicurus. A radical thinker of his time, Epicurus was a philosopher of the Hellenistic period, living from 341-271 BCE. Living in accordance with his philosophy, which came to be known as Epicureanism, he lived a rather simple, peaceful, and relaxing life. He utilized his garden as a classroom, and relied heavily on donations to survive. Aside from the occasional college party, Epicurus and his students lived mostly on bread and water. The Epicureans adopted empiricism as their theory of knowledge and atomistic materialism as their theory of the cosmos. They developed an egoistic hedonism as their theory of ethical values, and aside from specific cases, the Epicureans ignored politics and valued friendship above all other human relations, even familial ones. If you ever thought that friends were god’s apology for family, then you might actually be a follower of Epicurus. Epicurus developed his philosophy with a practical aim in mind, and so employed the use of logic and rationality as a means to happiness, rather than as tools for uncovering the truth for truth’s sake. Rejecting the importance of mathematics and purely scientific pursuits, he was interested in logic insofar as it served physics, and interested in physics insofar as it served ethics. Epicurus viewed many philosophers with a feeling of antipathy, denounced religious dogmatism, railed against the skeptics, and argued for a secular world. In sum, it’s surprising that he didn’t meet the same ending as Socrates! For the Epicureans, the senses are fundamental and at the basis of our knowledge. Senses have dominion over reason, because reason relies first on sense perception. We can only reason about something once we have gathered data from our senses about the thing in question. According to Epicurean theory, we should then judge this information according to our feelings or passion, and we should choose that which gives us pleasure, and avoid that which gives us pain. Does this mean that we have a justified theory of excessive drinking and eating? Don’t grab for that second bottle of wine just yet. Although Epicurus outlines a hedonistic ethic, it is a sophisticated theory that encourages moderation. After all, we won’t be happy tomorrow when we wake up to a throbbing head, sour stomach, and purple lips… especially if there is photographic evidence. First identifying with Aristotle’s notion that happiness is the highest good, Epicurus then couples this with the idea of pleasure, concluding that pleasure is the only manner from which to obtain happiness. Epicurus’ view of choosing the best pleasure consists in contemplating the future and choosing the option that will provide sustaining contentment and absence of pain. We must look to the future to determine what will be the cause of more pleasure and less pain. With this in mind, in the final analysis, we will gain more pleasure from moderating our intake of wine, and we will endure less pain by going to the dentist and getting that toothache taken care of… you know, before you need that root canal. Just as important to the Epicurean ethic is a reduction of desires. If we want less, we will be happy with less. The Epicurean path to happiness is not a result of an excess of external pleasures or material goods. Live simply, and without an excess of wealth or luxury, says Epicurus, and with that proclamation he very well may lay claim to the title of “first western minimalist!” Moderation, temperance, and cheerfulness are Epicurean virtues; unbridled luxury and feverish desire Epicurean vices. In a seeming contradiction to a hedonistic ethic, Epicurus believed that it was more pleasurable to do a kindness for someone rather than receive one. He also held that we should attempt friendship with all of mankind, and if this is not possible, at least don’t make enemies, and if this fails, and we make an enemy, avoid interacting with them. Friendship was the highest human relationship for Epicurus because it provided security, tranquility, and pleasure. He also urged against the rat race, because a race for wealth, fame, or power would destroy tranquility and peace by placing the contestant at the mercy of chance, public opinion, and disrupt the enjoyment of friendship. For similar reasons, a man who seeks to be happy should stay out of politics unless he has such an urge to a political career that he couldn’t be happy without it… and let’s be honest… those people probably shouldn’t be politicians in the first place. Being concerned with the pragmatic value of philosophy, and against truth for truth’s sake, it may again seem contradicting that Epicurus held so many proto-scientific views. 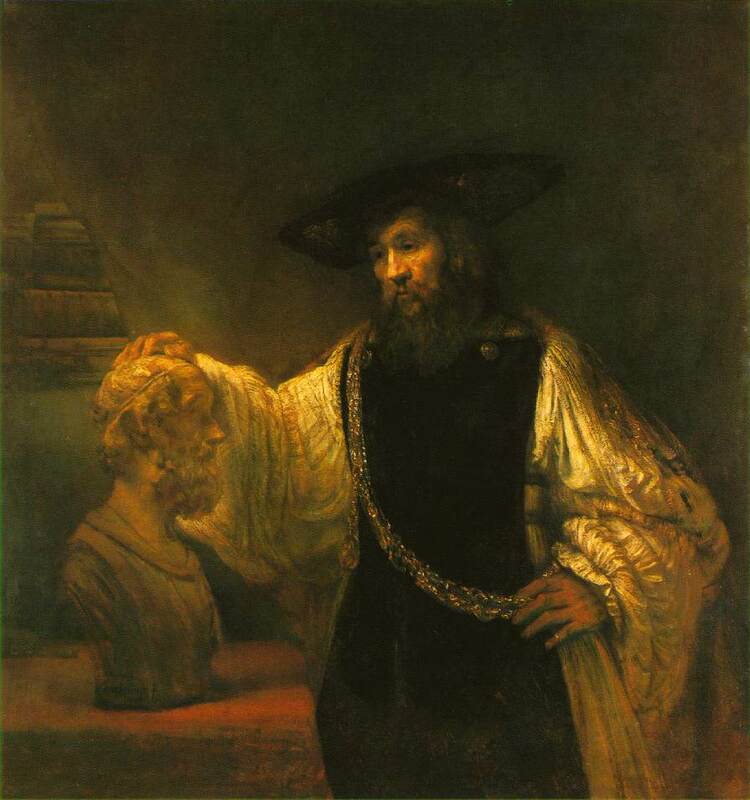 He adopted, with a few changes, Democritus’ atomistic theory of the cosmos. Epicurus believed that the universe was made up of the void (empty space) and an infinite number of small indivisible bits of matter in motion called atoms. These bits of matter make up the world by coming together to form the objects of the world, including us. Because of this, Epicurus also believed that the mind could be found in the body, and he argued against the idea of an immaterial soul that might live on once our body has died. He sought to discredit the mythological concepts of the world and its creation, and so proposed a purely mechanical explanation for our world coming into existence. Through the use of mechanical and atomic explanations of the natural world, he denied any interference of gods within human affairs. He also claimed that our world is just one of an infinite number of worlds, and that worlds come into existence, grow for awhile, decline, and eventually perish. With this, Epicurus became one of the first proponents of the multi-verse theory! Now, you might be wondering, how do these theories align with the idea of happiness being the highest good man can achieve? 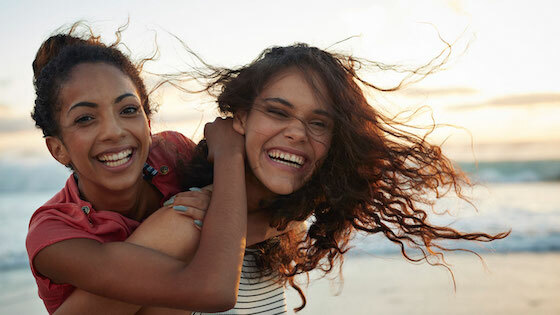 How can these theories help us live a better, happier life? After all, Epicurus has seemed to abandon the idea of god as a creator, the immaterial-eternal soul, and the idea of an afterlife. Well, for Epicurus, the existence of gods interfering in our world, and the possibility of punishment after death, was a great source of anxiety. Therefore, by justifying the world without need of a god, soul, or afterlife, he believed that he would relieve himself and others of this anxiety. Furthermore, he argued that death is nothing to be fearful about, because it does not concern us. Defending this notion, Epicurus stated that, “death is nothing to us; for that which is dissolved is devoid of sensation, and that which is devoid of sensation is nothing to us”. Imagine the eternity before your birth… the eternity of nothingness. That doesn’t seem scary; you didn’t experience that nothingness. 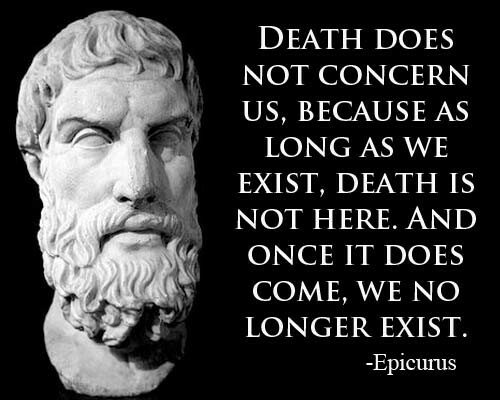 That same kind of eternity is what comes after death, according to Epicurus, and so we shouldn’t be afraid of that either. And here, as I address you all, these most important truths, more than any food app or extra bottle of wine, can give us true happiness. “The Apology” recounts the speech Socrates delivers to the court of Athens that means to put him to death for his odd practices. He is charged with “corrupting the youth and believing in strange gods” a crime that was punishable by death in ancient Athens. Socrates would have had some choice words for the man who had all the answers. Only a fool would truly believe that he had solved, absolutely, the mysteries of life. So let us examine the wisdom of Socrates. Let us consider the true nature of wisdom. Let us consider what convictions are worth clinging to, even in the face of death. And for once, let us all concede that we do not have all the answers. As a general disclaimer, before we delve head first into this, we must first recognize that “Apology” was not written by Socrates himself. It was put to paper by his disciple Plato. We must be careful of accepting everything Plato wrote without hesitation. Plato wrote his philosophical essays in the form of dialogues, where Socrates would often be used as a puppet to explain the ideas of Plato. It is difficult to decipher where Socrates ends and Plato begins. Saying that, “Apology” by Plato, although being rather dramatic, is generally accepted as an accurate representation of Socrates and his ideas on wisdom and the prospect of death. At the opening of “Apology”, Socrates stands before a court of Athens as he faces his accusers who wish to see him put to death. His accusers are Anytus, Meletus, and Lycon, all prominent Athenians who were prompted by politicians, poets and craftsmen to pursue the death of Socrates. Socrates addresses the crowd witnessing his trial and assures them that the charges against him are “false” and “slanderous”. He claims that these charges were brought against him because he possessed a wisdom that was “peculiarly human”. What wisdom does Socrates speak of? Socrates had recently been informed by the oracle at Delphi that he, of all men in Athens, was wisest. Socrates is very skeptical of this claim. 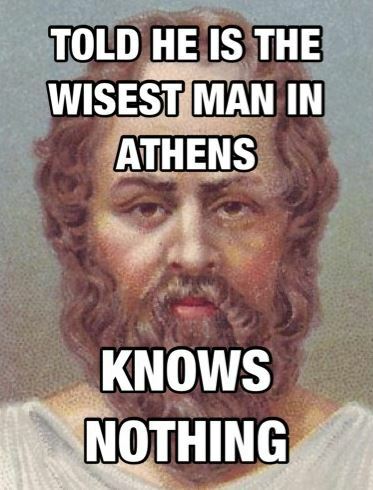 How is it that he could be wisest when Athens possesses so many notable politicians, artists and poets? Surely there must be some mistake. So Socrates describes how he first would visit with the politicians of Athens. Surely if he were to converse with these notable men of government, he would find that they possessed great wisdom. Socrates learned that the politicians, as is common with politicians, believed themselves to be very wise and the people as well thought them to be knowledgeable of all good things. Yet, they were not wise men. Socrates would try to show this to them, to shake them from their undeserved sense of superiority, and they would refuse him. The politicians would become angry at Socrates, and they would denounce him and send him away. Socrates again spoke with poets and craftsmen of Athens. They all appeared to have some knowledge of things, yet they too believed themselves superior and unduly wise. They would also become angry with Socrates for his insistence that they really knew nothing. Socrates would then come to form his conclusions about true wisdom and the nature of being wise. Wisdom is humility, accepting that we know very little or nothing at all. Socrates describes this conclusion when he states “I am wiser than that man. Neither of us probably knows anything worthwhile; but he thinks he does when he does not, and I do not and do not think I do”. Socrates is considered the wisest man in Athens by the Oracle, because instead of assuming he possesses wisdom, he accepts that wisdom is often unattainable and that we should instead continuously purse new and truer knowledge. So if Socrates is the wisest man in Athens, why does he not use this wisdom for the benefit of the city? He should enter politics and become influential within Athens, right? Socrates briefly tried his hand at politics. The philosopher, for a time, was the senator representing the tribe Antiochis. He oversaw the trial of several Athenian generals who were accused of failing to collect the bodies of fallen soldiers after a decisive naval battle. The generals were tried together, which was illegal, and they were threatened with death for their mistake. It was then that Socrates discovered a fatal flaw within democracy. The crowd, as well as the city, overwhelmingly opposed the generals. In response, the other judges of the trial went to great lengths to ensure the deaths of the accused. In this way they would gain great favor with the citizens of Athens. Socrates found this behavior disgraceful. Although these generals had not upheld their duties, justice as well as Athenian law should declare that they were undeserving of death. Socrates cast his vote to save the generals and was met with political backlash. The citizens hated him, threatened his life and demanded his impeachment. Socrates stood firm in his commitment to justice. He declares, “I cared not a straw for death. My only fear was the fear of doing an unrighteous or unholy thing”. Despite Socrates’ attempts, the generals would be put to death. Socrates himself would quietly slip away from politics. Shortly after, Athens would encounter a brief political revolution and democracy would be replaced with an oligarchical rule. Socrates considers himself to have been saved by the oligarchical leaders who were not slaves to the desires of the people. From these experiences, Socrates has grown to distrust politics. It is a system that denies justice and virtue, and instead produces evil, greedy men who look to control the throngs of foolish voters. Socrates insists that he is better off lecturing in the streets, showing the citizens the path to wisdom and revealing true virtue in the process. We must be careful at this point. Plato deeply hated democracy. “Apology” would have been written after the death of Socrates, who very much was killed through a democratic process. It is understandable that Plato would despise democracy for it’s role in killing his mentor and friend. It is possible that the dangers of democracy described here are actually Plato’s ideas filtered through the character of Socrates. We may never know for sure. During the course of the trial, Socrates begins to discuss the notion of death. His life very much is on the line, yet he seems to be unrepentant. He insists that if he were acquitted, he would continue his lectures, he would never denounce philosophy. Socrates shall not abandon his integrity and admit to these false crimes. He does not fear death. How can this be? Socrates concludes that death is either a state of permanent unconsciousness, like a dreamless sleep, or death is a moving on of the spirit to another realm. Either would be taken as a blessing. 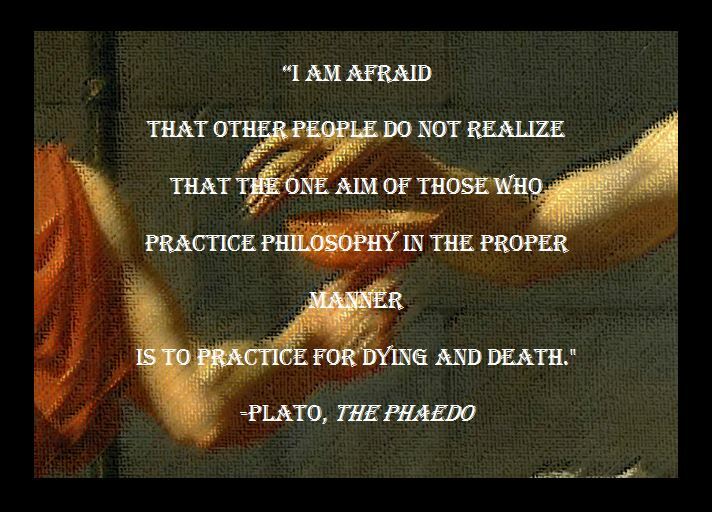 If death is like a dreamless sleep, then it would be a great gain according to Socrates. Peace for the man and the soul, eternally and without interruption, would be something that even a king could not denounce. And if death is a pilgrimage of the soul, then Socrates would gladly make that journey. He would look forward to meeting with the deceased who have gained fame for their great deeds. 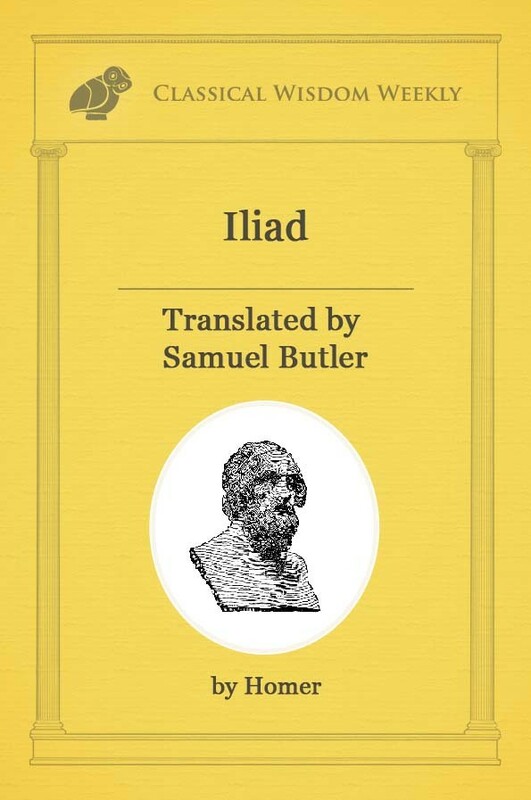 Would it not be magnificent to converse with the likes of Homer or Odysseus? Socrates could spend his time conversing with Agamemnon and Ajax from the Trojan war. In this new immortal realm, Socrates could continue his pursuit of wisdom and true knowledge. He could interview the ancient heroes and learn which of them are wise and which are fools. Death, perhaps, would be a welcome reprieve from life. 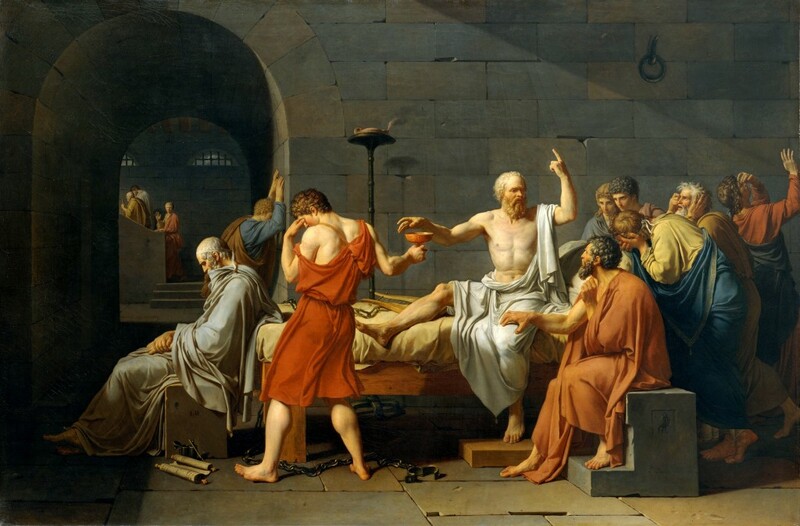 Socrates, by now, has been sentenced to die by a narrow majority. Instead of begging for his life, he recounts the purpose of his existence, standing beside his convictions until the very end. Socrates tells us that it was not through chance that he lived the way he did. He was chosen by the Gods to stir Athens from it’s laziness and self assured contentment. Like a gadfly might urge a lazy horse, Socrates attempted to shake Athenians from their slumber. He has been divinely guided to pursue knowledge and to help others find true wisdom. All through his trial he has been given no sign from God to repent, to beg for his life. So he now concludes that it is a far better thing for him to be relieved from this mortal world. Socrates tells us that death is a noble and inevitable end for all men; living unrighteous lives, however, is a sin that will truly haunt the soul. Socrates speaks to the audience and claims that “they will not easily find another like me”. And that Athens, for all it’s supposed wisdom, will ironically be remembered as the city that killed the wisest man of all. He remarks that even if he were given the chance to live, on the condition that he denounces his lectures and philosophy, he would still rather die. For the greatest life is the life that continuously discusses virtue, and explores the bounds of true wisdom. And the life that is unexamined, is not worth living. Socrates says his goodbyes to the crowd. He tells them that they must now depart. He must go to die, they must go to live. And only God will know which course is better. As “Apology” comes to a close, I can not help but feel a sense of loss for a man I never met who lived in a time that I will never know. The first intellectual martyr of Western civilization, Socrates’ legacy would be long remembered and deeply loved. As I imagine Socrates saying goodbye to his friends in Athens, turning to face his death, I am reminded of the words of Charles Dickens from his classic novel “A Tale Of Two Cities”. When considering the origins of Western philosophy there is a clear, almost indisputable holy trinity which gave birth to a dynasty of thought that is still with us to this day. 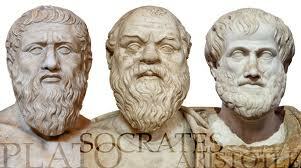 Whilst Socrates was certainly the father and Plato undeniably the son, it was Aristotle who exuded a ‘wholly’ spirit. He was complete and comprehensive in the sense that, unlike his forerunners, he was no mere philosopher, but also wrote extensively on physics, poetry, theatre, music, rhetoric, linguistics, politics, biology and zoology. He was, more than any other individual, responsible for shaping the European mind; and by extension, the minds of those in the Americas and Antipodes. Indeed, it is impossible to deny that Aristotle gave the world an academic cornucopia that was so varied and detailed that some of his assertions were only finally being corroborated, or in fact refuted, in the 19th century, over 2000 years after his death. 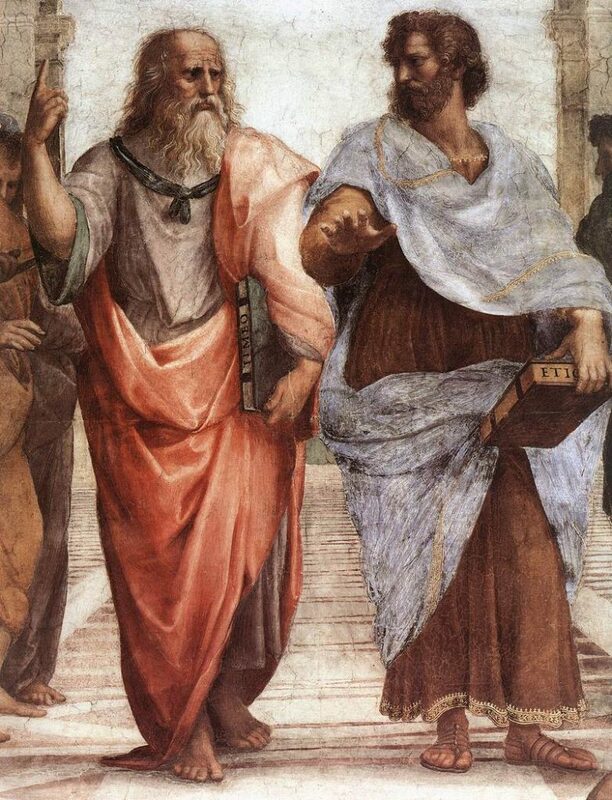 Of the trinity only Aristotle, unlike Socrates and Plato, was not an Athenian. His association with Athens only began in his 18th year when he enrolled as a student at Plato’s Academy. However, it is difficult to accurately speculate about his education prior to this. His father was a physician at the court of King Amyntas II of Macedonia, making it likely that Aristotle, between his birth in 384 BC and his migration to Athens in 367 BC, would have spent some part of his childhood in these auspicious circles. Also, it’s hard to imagine he was quite so precocious that he would have been able to slot so neatly into life at Plato’s Academy without at least some degree of formal education. Regardless of his level of ignorance or brilliance when he entered the Academy, over the next 20 years he managed to establish himself as Plato’s protégée; learning from, but by no means kowtowing to, the elder thinker. Much has been made of Aristotle’s departure from Plato, with some saying that the younger man rebelled against or even betrayed his tutor with the evolution of his philosophy. However, there is too much consensus and similarity between them to be quite so dramatic; evolution is a far more appropriate term than rebellion. Indeed, Aristotle only left the Academy when its founder died in 347 BC and the reins of power were transferred to Plato’s nephew, Speusippus. But why did Aristotle leave? Was he unhappy at the direction in which Speusippus was taking the Academy? Was he irked by being overlooked for the top job? Or was his concern the amount of anti-Macedonian sentiment rising up in the city which was lazily misdirected toward him, despite the fact that there was nothing to suggest that Aristotle was anything other than a loyal Athenian citizen? Whatever the reason, Aristotle decided that, for now, a hiatus from Athens would serve his interests best. And so he made his way to Assos, due south of the traditional site of Troy. There, under the protection of a former Academy classmate, the slave-turned-tyrant Hermias, he established his own school and married Hermias’ (presumably dentally challenged) daughter. However if Assos was where Aristotle cut his teeth as an educator, it was on Lesbos, where he moved in 345 BC, that he had the opportunity to examine and chronicle the flora and fauna of the island and surrounding sea; pioneering classification by genus and specie, and attempting to explain the very nature of each organism. He did this in an impressively academic manner; not content merely to observe, but also to understand the benefit of logging changes. Aristotle was not quite ready for a return to Athens when he opted to terminate his studies in natural history with the Lesbians. Instead he took a more circuitous route and retrod the ground he walked as a child; following in his father’s footsteps as an employee at the Macedonian court. Though not like his father as a medic, but a tutor and, as chaos theorists would have us believe, one that may have seriously altered the course of history… as the pupil he taught was none other than Alexander the Great. However, some questioned Aristotle’s motives for taking up the post. Was he tempted by the glamour of the position? By the riches it must surely have brought? Was it because Alexander’s father, King Philip II had the power to liberate and rebuild Aristotle’s home town of Stageira? Well… we could potentially answer ‘yes’ to all of these questions. However, if he was following the teachings of his mentor Plato, then Aristotle would have had no choice but to tutor the young prince. He would have seen it as his duty to make Alexander not merely Great, but a great philosopher king. 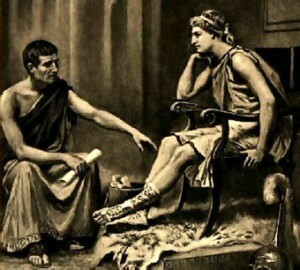 Aristotle did what he could with Alexander, but perhaps did not have sufficient classroom time as the young man was actively involved in his father’s government from the age of 16. Thus, when Alexander came to the throne in earnest (still at the tender age of 20), Aristotle had long since become superfluous. With his globe-trotting days behind him, and his attempts to philosophise with the soon-to-be most famous man in the world not wholly successful, Aristotle decided that the centre of the cultural world, Athens, was in need of fresh intellectual guidance. However, an absence of 13 years and open collusion with Athens’ subjugators, Macedonia, hadn’t given Aristotle, described in one source as a dandy with rings on his fingers and a fashionable hair cut, the authority to walk brazenly back into the Academy and expect to be welcomed with open arms (though his flash appearance did manage to bag him a second wife). So instead he opted to establish his own school, the Lyceum. The school and its followers were often referred to as Peripatetics, a term derived from the Greek word ‘to walk’ and apocryphally thought to reflect Aristotle’s penchant for teaching while wandering the grounds. Incongruously, it is quite possible there was very little altruism in Aristotle’s desire to teach. He openly admitted that knowledge and teaching were intertwined to the extent that a man could never truly understand something unless he could then impart that knowledge to another. Thus to teach was for Aristotle, first and foremost, beneficial to himself. It’s hard to know if the Lyceum was more important as a college of research or one of individual enlightenment, but it was certainly during this period that Aristotle and his acolytes seem to have done much of the work for which he is now famous. In addition to those texts (Poetics, Physics, Metaphysics, Nicomachean Ethics, etc), he (or his ‘interns’) also collected maps, codified the Athenian constitution, added a 5th element to those established by Empedocles, attempted to link good grammar practices to logic, and revealed the scientific principles behind the camera obscura. Significantly, though often overlooked, the school also drudged through the archives at Delphi to log the athletes who had competed in the sporting events held there whilst additionally cross-referencing them with those who had participated in Athenian dramatic festivals. This was done not merely for the love of bureaucracy, but in an attempt to establish an accepted chronology. After all, it’s easy for us to forget that the ancient world didn’t have the luxury of a quick and easy ‘Before Christ’ or ‘Anno Domini’ way of looking at things. The end of the Great life was the end of a chance for a worthwhile life for Aristotle, as it now became very difficult to live in Athens if one had, or was perceived to have, Macedonian sympathies. While Alexander was alive the Athenians knew that there was no chance of fighting for independence, but with his death, there was instability and a chance of revolt. 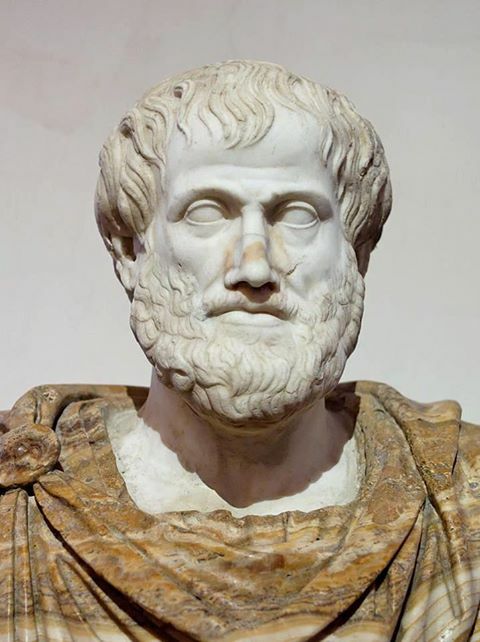 Consequently, Aristotle fled to Chalcis in the following year as, in his own words, he “would not allow Athenians to sin twice against philosophy”; a reference to the public trial and execution of Socrates in 399 BC. For whatever reason, life on Chalcis was not sympathetic to Aristotle. After only one year he died of natural causes, aged 62. 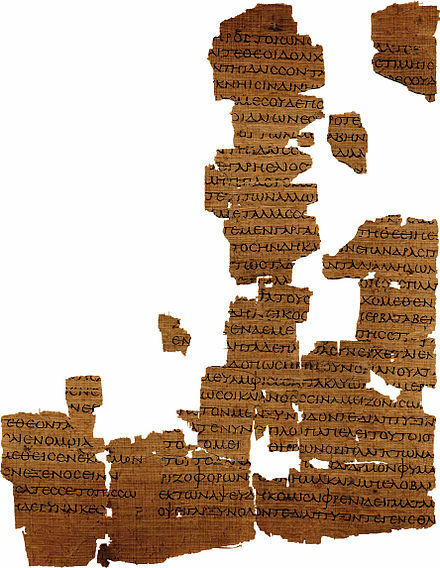 Aristotle’s legacy flourished with barely an interruption in the AD period, but from his own time until the first century BC, Peripatetics were severely marginalized in the Greek world. A story that Aristotle’s texts were lost, hidden in a basement for centuries, before being taken to Rome in 86 BC accounts well for this gap, but is more than slightly fanciful. There is no satisfactory explanation for Aristotle’s temporary wane in popularity, but we can say with some authority that when it waxed again it did so with dramatic virulence. Dante dubbed him ‘the master of those that know’, whilst Thomas Aquinas simply called him ‘the philosopher’. His influence was not restricted to the Latin world, he was also respected by Jewish scholars of the middle-ages while their Islamic counterparts referred to him as ‘the first teacher’. He is said to have had a mind which was “ordered, balanced and stunningly capacious”. Indeed, some suspect that he may have been the last man in existence who knew all the information that it was possible (in his own time) to learn. “We must not listen to those who urge us to think human thoughts since we are human, and mortal thoughts since we are mortal; rather, we should as far as possible immortalize ourselves and do all we can to live by the finest element in us – for if it is small in bulk, it is far greater than anything else in power and worth”. Early philosophy in ancient Greece sought to explain the nature of the universe. For instance, there was Thales of Miletus, who held the rather bold belief that the entire universe is made of water in one form or the other. This dramatic delve into the study of metaphysics was very popular with early philosophers and was inevitably built upon and reproduced in various forms. 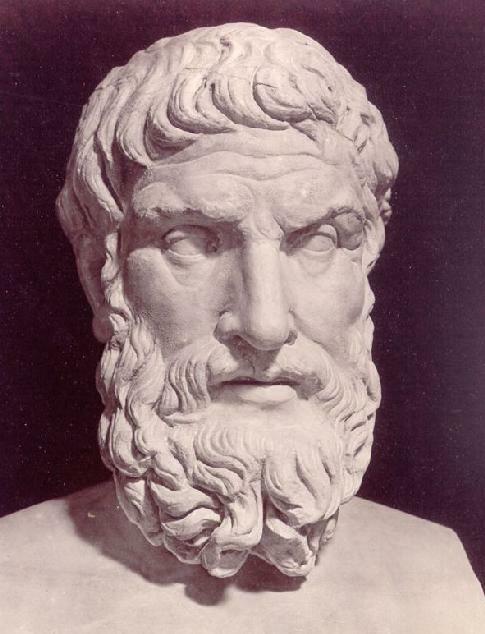 By the time Epicurus was born in 341 BCE on the Aegean island of Samos, popular philosophy was shifting emphasis from metaphysics (determining the nature of the universe) to personal ethics. It was a change that was prompted by Socrates some hundred years beforehand. Socrates, through his teachings and lectures, forced individuals to examine basic human values and ethics. And because of this, people began asking themselves some very profound and fundamental questions. What does it mean to be moral? What is the true nature of human ethics? How should one live their life? Epicurus sought to answer these questions. His teachings would gain attention for their dramatic departure from commonly held religious beliefs. He was determined to help others comprehend the true purpose of life and come closer to understanding the nature of death. 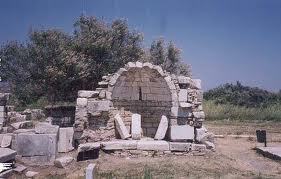 Epicurus was taught philosophy as a boy by a disciple of Plato on the island of Samos. As a man, he diligently studied the teachings of the atomist philosophers Democritus and Leucippus. Epicurus would eventually adopt the view that the entire universe is composed only of atoms and empty space, which is a line of thought that we are more accustomed to. Epicurus believed that the universe was logical and behaved with predictable tendencies. Because of this, he was a strong proponent of finding true knowledge through observable, objectively verifiable phenomenon. In this regard his thinking was very similar to the modern scientific method. His beliefs ran counter to the commonly held idea that knowledge can be found through mythology and religion. This stance was not one that was accepted by much of ancient Greece. It would appear that Epicurus was denying the existence of the gods in favor for a reliance on scientific thought. And indeed, Epicurus is said to have stated, “It is folly for a man to pray to the gods for that which he has the power to attain by himself”. Needless to say, this made him rather unpopular. Keeping in line with his belief that the gods did not determine the course of one’s life, he was also a strong proponent of the idea of free will. To Epicurus, each human was the captain of his or her own ship. You may choose to be virtuous or you may choose to be evil. It is your decision. But if we are the author of our own stories, then that might seem to put a lot of pressure on an individual. If I am the sole force determining the course of my life, then how should I best lead my life?! Epicurus had an answer for this as well. A common, and incorrect, assumption of Epicurus was that he promoted finding happiness through material wealth and superficial excess. According to Epicurus, we should all seek a life of knowledge and temperance, surrounded by friends and free from fear and pain. And to Epicurus, there was one obstacle that plagued the hearts of men; it was this one thing that kept us from living a happy and fulfilled life. Epicurus believed that finding a life of peaceful contentment devoid of pain or fear should be the goal of every life. Epicurus believed that the one thing that was holding people back from truly accomplishing this feat was the fear of death. The inhabitants of ancient Greece lived in constant fear of the wrath of the Gods. They viewed their mortal life as a temporary condition. Their sins and wrongdoings would be judged harshly by temperamental, vengeful gods. The expectation of pain and torment for eternity at the hands of Thanatos, the terrifying personification of death, was commonplace in ancient Greece. 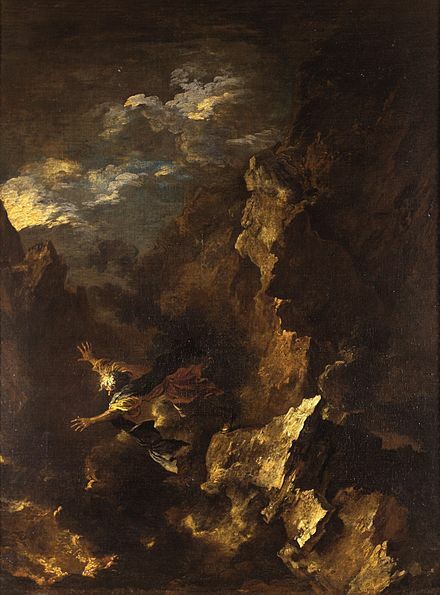 Epicurus believed that the main obstacle to a fulfilled life was the irrational fear of incurring the wrath of the gods and suffering for eternity in the lair of Hades. We are so preoccupied with fearing death that we refuse to acknowledge life. Epicurus sought to remedy this. And he did so by explaining the nature of death. To Epicurus, the entire world was constructed entirely of atoms and empty space. Epicurus reasoned that the human soul could not be constructed of empty space. The consciousness (the soul) interacted very closely, very dynamically with the body. This would mean that the soul was made of atoms, presumably dispersed throughout the body. However these atoms would be fragile. Epicurus taught that at the time of our death, the soul would evaporate entirely. Death marks the end of consciousness and sensation. This would mean that we would be unable to feel any emotional or physical pain. If we are no longer capable of feeling fear or pain when we decease, then it is foolish to be preoccupied with the notion of death. Epicurus believed that this fear was an obstacle to true happiness in this lifetime. If we could accept death, not ignore it or mystify it, but truly accept it as the end of being, then we could find happiness in this life. Epicurus was viewed as dismissive of religion and therefore disliked by much of Greece. He did however gain a small but very loyal following. He founded a school of philosophy in Athens named “The Garden”, after a garden he enjoyed as a child on the island of Samos. A stone’s throw from Plato’s Academy, The Garden was one of the first philosophical establishments that welcomed both women and slaves. 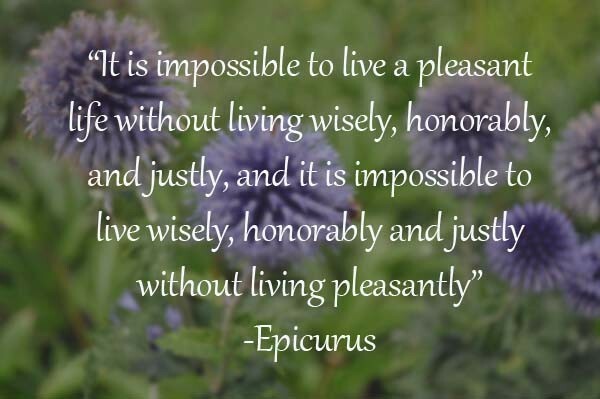 Epicurus lived his life free from a fear of death. He tried to teach others to pursue similar goals. He was a man who knew that he was the master of his own life, the sole captain of his ship. He inspired others to pursue scientific knowledge and to live freely.